Does the KM Ant Pro System Work? Please tell me how it works and what your experience is with this system? Carpenter ants are mother natures way of aggravating us. Especially if you live in a wooded area. They are as common as houseflies, and can be found practically anywhere there is wood, moisture, decay, etc. They don't eat the wood, they just nest in it. When using the KM Ant Pro system, and Gourmet Liquid Ant Bait, you are giving the ants an "alternative" food source. One that they will hopefully find attractive and prefer over their already existing food sources such as aphids, mealybugs, scales, etc. The Gourmet Liquid Ant Bait contains a slow acting mineral called Boron which is converted to Borax. This mineral kills the ants very slowly, usually in about a month. This is AFTER they have consumed they bait. So the entire process can take several weeks to a couple of months to work. This is with existing ant infestations. This is the most effective and environmentally friendly way to kill the ants. The Ant Pro system will kill existing ants and will also help to control invading ants from outside areas. To say you will never see an ant when using this system is unlikely. That is because ants are very social and have "scouts" that constantly forage for food. That is probably what you saw on your desk. If you find a single roaming ant, chances are it is a scout, this is true with almost all ant species. So the short answer is - that Carpenter ants at some point will find and feed on the liquid ant bait and begin dying. How long this takes depends on where the colony(s) are located. They can be several hundred feet away or more. There are usually multiple nests. So killing all existing ants can take some time. 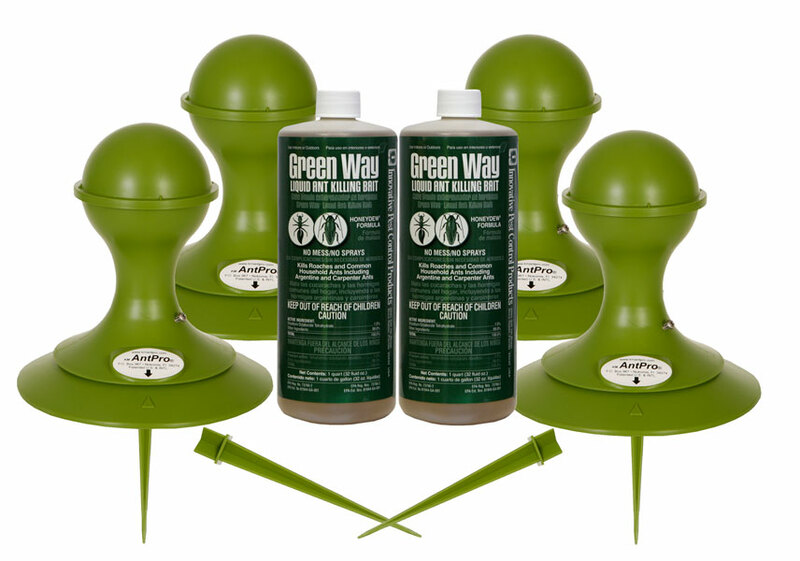 The Ant Pro system will also provide a "barrier" that kills invading ants. This is ongoing. What's the alternative? Regular spraying of the entire area with pesticides. This is what ALL pest control companies offer, most even require some sort of contract. It's like "contract killing". lol The environmental effective from this can be huge, as ALL pesticides kill ALL insects, arachnids, etc. This is the reason that we have now sold over 100,000 KM Ant Pro Stations, and probably double that amount of liquid bait in the last 11 years. Our returns are very, very few. The system works, it's environmentally compatible, and compared to the cost of hiring someone to continually spray, a HUGE savings. is this product work indoor too? is it very effective to carpenter black ants? is it harmful to cats? The KM Ant Pro System is for outdoor use only. It provides an alternative food source for ants. Most ants do not feed indoors, so baiting indoors as an overall method does not work. Spot baiting can provide limited control indoors, but the KM Ant Pro System is designed for outdoor use. We have been offering the KM Ant Pro System for over 12 years and have sold over 100,000 stations, and over 200,000 quarts of Gourmet Liquid Ant Bait. The returns on these products are very few, less than 1%. You can check out the reviews and see what others have said about it. The KM Ant Pro System is the absolute safest way to control ants outdoors, it is environmentally friendly and safe for animals.